BRYAN EATON/Staff photo. John Tedoldi respects the U.S. 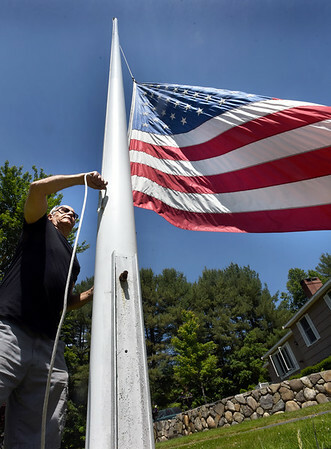 Flag and what it stands for, so has been flying an oversized eight-by-twelve foot flag at his South Hampton Road, Amesbury home for almost 46 years. The pole is made of two sections that he salvaged and had welded together in 1973. One was a light pole at the old Amesbury Hospital that was hit by a car in 1972, and an emergency phone pole on Interstate 495 that met a similar fate in 1973. He changes the flags about every four years as they get worn out.